A collection of six game prostheses designed to be worn by an LG VS840 4G LTE phone. A collection of six game prostheses played by opening camera mode add physicality back into mobile gameplay. Each of these six game prostheses are designed to be worn by an LG VS840 4G LTE phone. 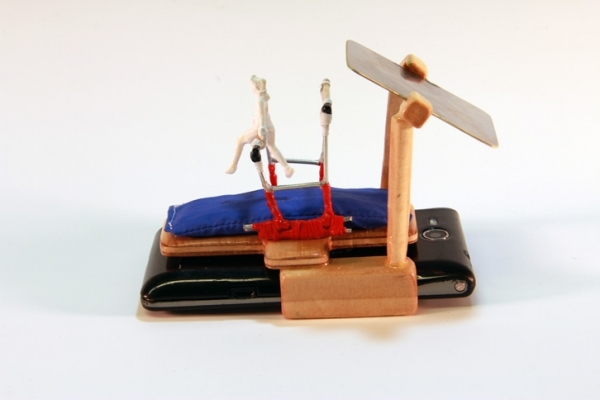 These apparatuses are played by opening camera mode – the centered camera will shoot a field of play on the back of the phone reflected in a mirror held up by two wooden arms located directly above the lens. Gameplay images were taken with the phone’s camera. Game Prostheses for Phone was featured in INCITE Journal of Experimental Media #7: Sports, edited by Astria Suparak and Brett Kashmere and built by Isla Hansen in 2013.